I've finally divined much of the reason for my recent unproductiveness: Rome: Total War. It's a marvelous game, sharing many elements with my previous problem time-waster, Civilization 4. 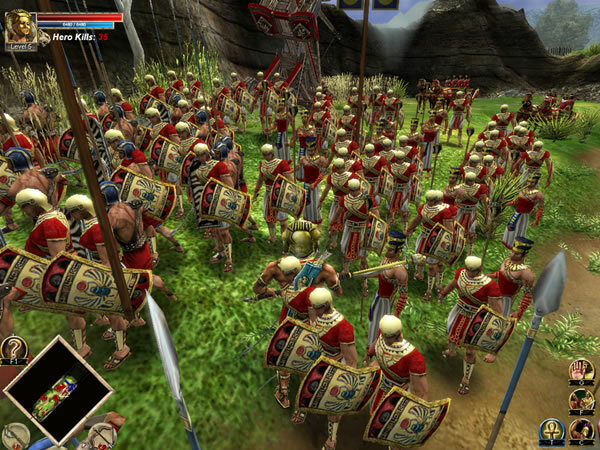 One difference, however, is that Rome: Total War presents the player with a dynasty with which to control the Roman World. Each member of the family has different attributes, and I'm sorry to say that at least twice, the House of Pharaoh was led by a man whose moniker was "the mad." But it's a wonderful game. A great combination of elements which range from commanding armies in the field to a larger map-based portion from which the player surveys the known world and plans their conquests. I learned a lot from playing. Asia Minor is a hellacious place to get mired into, but ultimately a good, productive stronghold once it is entirely subjugated. With enough money, Byzantium can be bought. Who is running which city is important. I intended to play it through just once, just to see the Pharaohs of Egypt conquer the Known World and take Rome. However, the combination of complex elements, managing the major cities, plotting to reinforce this city while dealing with that army made the game time-consuming. Enjoyably so, but it wasn't good for my productivity, especially since I faced a difficult project. So I say farewell to my mighty dynasty of conquering Pharaohs. Your experiences and sacrifices will someday live on in stories. On Easter Sunday, I received word that I had been accepted into the Cthulhu 2012 anthology from Mythos books. This is a professional-level anthology which pays five cents a word. Fame, fortune, and young nubile fanbase, here I come! The Queen of Science was off visiting relatives last week, so I was alone doing the usual weekly stuff. This led to certain unusual times for doing things, such as the weekend shopping at 9 Wednesday evening. "Guitar Hero: Metallica is out tomorrow, right?" This is the first half of the Warmachine battle report my brother put together last month. I'm pretty impressed... it's the distilled action of what happens in a Warmachine game, without the dice-rolling, the animated argument, and the tedious waiting for a player to make a decision. It establishes a good narrative, the background music is excellent, and it moves along at a good clip. Enjoy. Two points I'd like to make. One, this wouldn't have looked half as good if the models weren't painted. Two, I suggested the Adventures of Baron Munchausen reference. A discussion is being had in front of the counter. One of the two is discussing how his wife was once dissed, and that she has never let him forget it. "Then you know what I'm talking about." And I do not open my mouth and say, "No I don't, because I married a sane and rational person." Because sometimes, good customer service is not telling the customer that he's being an asshat. April 7, 2009. The weather is cold, the rain is interspersed with snow and sleet. I am officially forty. I've recently learned that I am not the only child of the eighties who thought I would never be this old. Reagan's hawk posturing (later softened) led me to believe that there was going to be at least a 'limited nuclear exchange' at some point in the near future, and I would be dead before I was thirty-five. If you didn't live through the eighties, read Watchmen, Dark Knight Returns, watch Quiet Earth or read the rulebook for Gamma World. In school, we read Benet's By the Waters of Babylon, and The Planet of the Apes was a regular on television. So according to my inner seventeen year-old, every day after thirty-five has been a bonus. But that's not the best reason to celebrate today. This morning I received a miscellany of comments from friends, organized by the Queen of Science. If an individual's wealth is measured by the friends he has and the company he keeps, then I am rich beyond Gordon Gecko's wildest dreams of avarice. I have the best friends and family in the world, and I married an incredibly wonderful woman. I am both humbled and moved by this gift of love. Thank you, my friends. For those gentle readers who are not aware, my current job is a cashier/counter person at the local game store. And I'm coming to realize that part of my job is being a bartender to geeks. When there's no one else to talk to, there's always the bartender. If you want to talk about Naruto, your Magic: The Gathering deck, Warmachine, Warhammer, or your D&D character, the bartender is always there. He'll listen, and on occasion give encouragement, because there are few enough places to talk about these things with people who understand, or at least sympathize. There will be the occasional story told here, generally with the names changed, which will be placed under the "Bartender to geeks" label. Well, the Egypt thing just isn't going away. Over the last couple of months, I've picked up a couple of computer games that allow you to command the forces of Ancient Egypt. Rise and Fall, Civilizations at War is a colorful game about raising armies and then throwing them at your opponent. It is also a firm believer in the heroic leader concept: your general is the stompiest badass on the field. In addition to the usual resources of gold and wood, Rise and Fall also uses the concept of glory. Glory can be used to increase to upgrade your hero's level, or to level up units. In Egyptian fashion, the more prestigious your units are, the more clothing they tend to wear. And the more graphically pretty they are. Gameplay is otherwise bog-standard real-time strategy. Build structures that allow you to recruit forces. Some troops work better against other sorts of troops (spear-carriers do well against cavalry, for example). 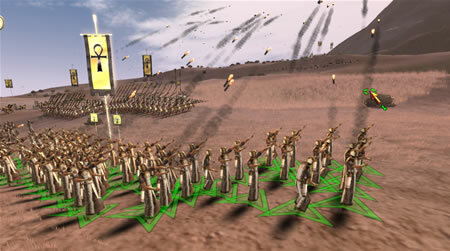 As an archery fan, I am sad that I can't get the sun covered by arrows effect of massive arrows in the air, but the Egyptian chariot archers that use fire-arrows satisfy me well enough. I tend to avoid the camel-mounted units, since the Egyptians did not use domesticated camels. Rise and Fall is a good game to play I want to spend an hour beating down Romans or Persians. Once the rather short campaigns are done, all that's left is to play skirmishes against the computer on the various provided maps. Which is too bad, because the on-line community hasn't created a lot of them.